A bicycle of Nature, to satisfy human’s most social and inherent instinct for traveling. The bicycle has been deemed as one of the most environmental-friendly mode of transport, but PABensen, in collaboration with Professor Yap Fook Fah, has decided to push its greenness by a notch higher with the ONEWOOD Bike. Professor Yap from the School of Mechanical and Aerospace Engineering (MAE), Nanyang Technological University (NTU), Singapore, has always been interested in the construction of bicycles and has studied it extensively. He was introduced to PABensen by a fellow colleague who was responsible for guiding the NTU Diesel Car Racing Team in the construction of a wooden car. The wooden car participated in the Shell Eco Marathon Competition, where PABensen sponsored and handcrafted the team’s wooden steering wheel. One day, while in search of wood, Bensen chanced upon Jason Chang from Pacific Forest. Their in-housed manufactured wood, otherwise known as ONEWOOD, immediately caught Bensen’s interest. Made from compressed wood fibre, ONEWOOD can be easily molded into any shape and its compacted nature even enhances the wood’s durability. It came to Bensen’s realisation that ONEWOOD is the perfect building material for the Wooden Bicycle. To top the bike’s innovation, PABensen’s co-founder and professor at the School of Electrical and Electronic Engineering (EEE), NTU, Singapore, Pina Marziliano, further proposed a Design and Innovation Project to a group of Information and Engineering Media (IEM) students to develop a navigation and security system using a GPS, to later be integrated into the wooden bike. While the Wooden Bicycle is currently a working prototype, it is envisioned as one of the first green bicycles locally created with a social intention in mind, one, which revolutionize the way a bicycle operates. 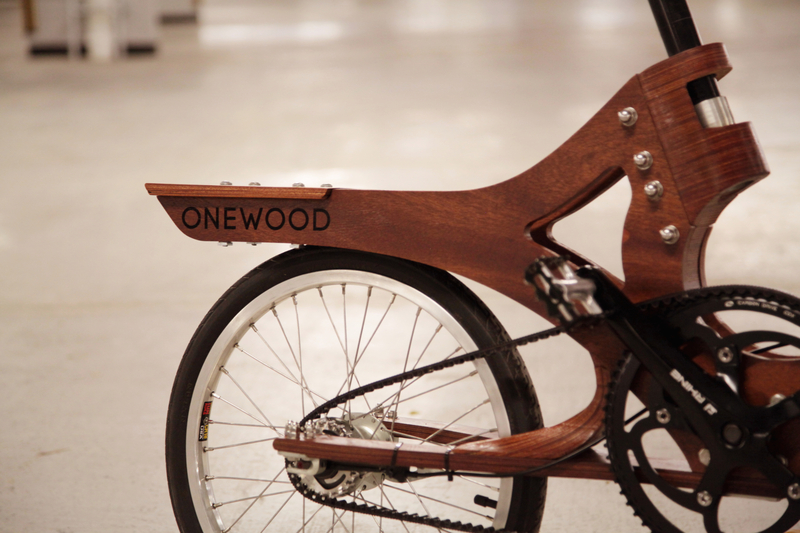 Made entirely out of ONEWOOD, the Wooden Bicycle is remarkably tough and resistant to impact. The fatigue life of wood rivals carbon and is substantially longer than aluminum or steel, deeming it a longer lifespan as compared to normal bicycles. Even the minimal metal parts used to construct the joints within the bicycle are made from stainless steel and aluminium, further increasing its durability. The Wooden Bicycle is completely belt-driven. It does not rust, saving users’ need to constantly oil the chain like in any other bicycle. Moreover, with its shock-absorbent quality, users can be sure to enjoy a much smoother ride. In addition, with a GPS system infused within the bicycle, users can track their current position (as well as other users who are connected to the application) with a map and locate any facilities such as restaurants or toilets nearby. This lends ease and convenience to users to explore the vicinity as they cycle and at the same time, connect with other users on the go. Collaborating companies of the application may also advertise their product or service with us, allowing users to enjoy discounts when they visit their shops as they cycle. In fact, Professor Yap and PABensen have envisaged the Wooden Bicycle as a share bike for Singaporeans, with several pick-up points island-wide. The GPS system would further be useful in tracking the availability of bicycles at each pick-up point, facilitating the deployment of bicycle stocks at each point in time. With nearly 50km of cycling paths to be added all around Singapore by the end of 2015, their dream is not far from coming true.